My tomatoes — most of them indeterminate heirloom varieties — endured cool temperatures during much of June. Then, throughout late June and early July, they were bombarded with record rainfall, ghastly heat, and oppressive humidity — the very conditions that lead to blight (as indicated by yellowed or browned foliage). But my plants are free of blight. The foliage is as green as the Schwinn banana-seat bicycle my parents gave me for my 9th birthday. In other words, the foliage is screamin’-green. First, the tomatoes are growing in a raised bed. Gardening on higher ground affords excellent drainage. Next, the beds are topped with a thick layer of mulch. Mulch, which in this case is weed-free straw, helps the soil to retain moisture. Furthermore, during a heavy rain, the mulch keeps water — and potential fungal spores – from bouncing off the soil and splashing onto the lower leaves. And finally, I remove suckers from the vines. Suckers burden the plants with excess foliage. Too much lushness promotes the shady, wet conditions that inevitably lead to problems (like fungal diseases). If you need a refresher course on sucker-identification, please take a moment to be read this post from 2012: De-Suckering My Tomatoes. As you can see, the vines have reached the top of their wooden trellis. I like the trellis better than cages, because the vines remain within easy reach. Suckers — and any problems, should they arise — are in plain view. Fruit, of course, is in plain view, too. My theory: Pollinating insects, such as honey bees, have an easier time finding tomato flowers when the vines are grown on a tall trellis. Again, this is theory, not fact. But it sounds reasonable, yes? 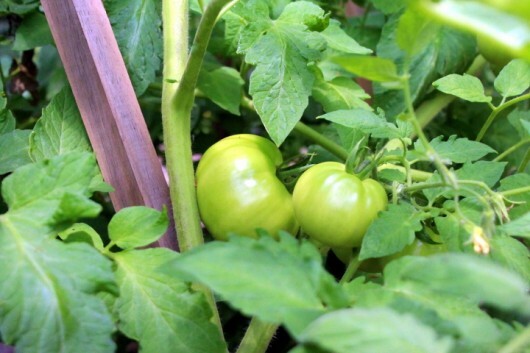 Update: Thanks to reader Beverly, I now know that tomatoes do not require insects for pollination. Wind — or a breeze — or anything that shakes the flowers — will cause pollen from the anthers to contact the stigma. 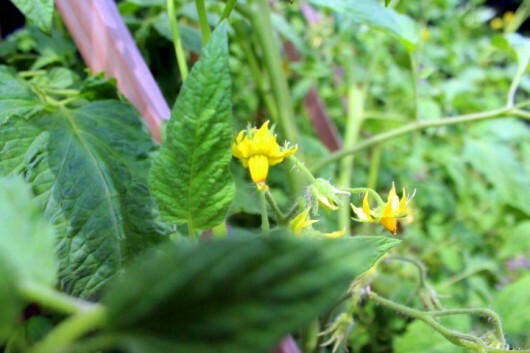 In any event, my plants’ yellow blossoms are being pollinated, because I have tomatoes — lots of ’em! Well. I hope you’ll talk about your tomato plants in the comments field below. Feel free to brag, just as I did. Probably you are already harvesting fruit, and you grew your plants on level ground, in wire cages, without mulch and without removing a single sucker. Kevin, I’ve been worried about blight because our weather conditions in NH have been the same as yours. But so far (fingers crossed), all is well! Our tomato plants are green and healthy and we have a LOT of tomatoes green and large on the vines. Like you, I trellis, mulch, and remove suckers. I also remove the bottom branches up to about 6-8″ to allow air circulation beneath the plants. I think it’s time for some fried green tomatoes, don’t you? My mulched and caged tomato plants are huge, very green and full of fruit. However, my little Balconi dwarf tomato plant in its hanging basket is the one with fruit getting ripe. Little tiny tomatoes, but they’re blushing red as I type this. Summer will officially begin when I eat the first one. Yours look grand also, Kevin! My tomatoes are in raised beds with straw mulch, well trellised, and suckers trimmed, but they are full of the yellow blight – It’s hot and humid in southern Indiana and when it rains, we get the blight. I cut those leaves off every day and the plants seem to deal with it. Our harvest will be much better this year than last year. Just harvested my first few tomatoes in Kansas City! Did you know you can pick them as soon as they start to turn because by then they have sealed themselves off from the plant? So they are finishing ripening on my kitchen counter top where squirrels can’t beat me to them. The plants I started from seed are tiny. The ones I bought are doing great and I have a couple of large volunteer plants in the compost pile. Just staked them up yesterday. Hi Jessica – Like you, I let most of my tomatoes ripen indoors, and away from sunlight. Always a good plan if critters/storms are a problem. I planted my 10 tomato transplants in raised beds on April 1st. What a suprise!!!! I had 40 tomatoes on 1 plant. They were on the small side and not cherry tomatoes. Just finish harvesting 250 or more tomatoes, nice slicing size. No problems except for a few catipillars. Almost organic, I used some Miracle Grow. Plenty of compost, fish emulshion and epsom salt. Plants are still healthy for July 14th. I should get 25 or so nice tomatoes by the end of the season. I’m in South Louisiana Zone 8. You can cut the humidity with a knife. Today I received your 1st newsletter and I’m loving it. Oh my! This year I planted a grape tomato plant. Along with my usual heirlooms & beefsteaks & Romas. Now mind you my tomatoes usually do well in the area they are in. My usual plants look normal but this grape tomato thing has taken over!! I pinched back & cut suckers like all my others. It has gone nuts. We had rain everyday for close to a week & a half so I couldn’t get into my garden. That’s when it went crazy. It is staked & taped but is taking over space in & out of its own domain. It’s covered in flowers & 100s of tiny grape tomatoes. I’ve decided to let it take it’s own course because it’s almost too scary to get close to. I’m just hoping neighbors & co workers want grape tomatoes!! :). Thanks for all the entertainment & helpful hints I’ve gotten off your website. Some early blight is occurring on the lower leaves of my tomatoes here in western NY. They are in raised beds, without mulch, and planted a bit too close together. But the problem is not out of hand yet. I’ve cut the lower stems out and they look pretty good this evening. I will get some straw in under them soon and hope that will help. I have lots of plum tomatoes but not too many larger slicing ones, so far. Such is the case here by Lake Ontario with our slow warm up in the spring. We just haven’t had the prolonged dry heat we need yet. I think one of the greatest rewards of the summer is that first plate of juicy sliced tomatoes! Worth all the hovering and concern. One word sums up my tomato season this year…Slow… I just came in from throwing season extending fabric over all of them because temps here in SE WIsconsin are dipping into low 50’s and possibly 40’s tonight. I don’t want anything to stunt their growth any further. I put my potted eggplants in the garage. I have a cherry tomato that my neighbor gave me that is producing but not any ripe ones yet. My Black from Toula has lots of flowers and spotted the start of the first tomato. Not even flowers yet on the Green Zebras and Pink Brandywines. Thankfully, I have seen no blight yet. It’s surprising with the amount of rain we’ve had which is evidenced by the swarms of mosquitos on the prowl. My tomatoes are in raised beds, tied to upright stakes, suckers removed and wheat straw mulched around their bases. I had my first ripe ones before the end of June…and that’s early for here in the St. Louis area. Nothing since, however. The green fruits have just been hanging there and the plants seem to be sleeping. Nice and green, but very little growth and no ripening for about three weeks. The weather’s been great, too. It’s a real head scratcher for me. Oops, mulched them with straw and pulled the suckers off,hopefully that will help? I have five varieties in a small garden in St. Louis. All are doing well and a few weeks ago started producing fruit. It seems they have stalled – I don’t notice fruit growth or coloration changes – they’re still green. We’ve had quite a seesaw summer with temps, rain, etc. Hoping next week some will be ready to pick! Here in South-East Texas; My ‘maters (in a raised bed with cages, unmulched but I will mulch next year) have HAD IT! It’s too dang hot and humid for them. We had early summer rain and the blight came right after. Then, the fire ants. Invaded the whole bed and actually ate some of the fruit! Amazing to see ants going crazy coming out of a tomato; like something out of a garderner’s horror movie. I’ve been fighting them but they’re still winning. All in all, I’d say we had a successful year; we got more than we did last year. I keep trying and I keep getting better! Tallho! I’ve had ripe tomatoes for 3 weeks even though I planted them late. I only grow small ones–grape, yellow pear, sweet 100–so they are ready for the salad and pasta bowl with no chopping. I also like the little ones for damage control–if something nibbles on a nice ripe tomato, well, you only lost one bite of your crop instead of a nice big tomato ruined! I planted some in the ground and some in straw bales (trying that for the first time). The ones in the ground I mulch with 4-6 inches of straw and then I ignore them. I let them sprawl–no suckering, no staking–and I’ve been doing this for 20+ years with no blight and few pests (knock wood!) Yes, the vines get big, but I was picking a mixing bowl full of tomatoes every other day all last summer with just 3 plants. My little dog learned to reach under the vines and help himself to the nice ripe ones I miss. And boy is it ever hot and humid down here in SW Missouri. Im in Western New York also. All 74 plants are loaded with huge green tomatoes! Fried a few last night. Yummy. I have 2-32 foot x 4 foot raised beds just for maters. I grow celebrity, veeroma, SanMarzano and a few beefsteaks. When planting them I used 1/4 cup powdered milk and about a tablespoon of 10-10-10. I then laid a thick layer of newspaper and straw on top of drip irrigation. Wow!!! I have not been this successful in 10 years. Not a single spot of early blight and have been using fungicide for late blight since the beginning. Even with all the rain I’ve had there’s no blossom end rot. Of course I’ve trimmed everything below first fruits and pinch suckers on the indeterminants (which are climbing string). I do not pinch suckers on determinants (in big cages). As far as baking soda for fungicide…I tried that last year and my plants did not like it either. If you stop using it, they will bounce back in a week or two. Use daconil instead. As much as I do DIY style, some things are better left coming from the store. Wish me luck….got a 1000 jars to fill this year. I love my garden! I’ve also kept my plants to one (for grape and smaller types, two) stems apiece. They climb up 4 x 8 foot concrete reinforcing grid, very easy to manage, just weave them in & out. I picked my first Early Girl today, and the first Amish paste will be ready within a week. Everything is healthy so far (heavily mulched, like Kevin’s) and loaded with fruit. The only unhappy variety is Costoluto Genovese, most of whose fruit have some version of blossom end rot. (And the small paste types, which are what usually get hit with it for me, are untouched.) Maybe it needs the dry heat of Italy. Screaming green here in northern New Jersey too!!! And I’m TICKLED PINK! By this time last year we had such a white fly problem. Also, last year I babied my toms watering super diligently and to no avail. Early blight and bugs took almost every plant. But this year, I’m showing a little TOUGH LOVE…deep and less frequent watering (when no rain) and chopping those suckers off! I am seeing a few leaves at the bottom with yellowing and blight…removing those leaves asap, like Robin above, and my toms seem ok with it too. I really enjoy your updates. Cheers! oh i feel so much better reading all these posts after worrying over the lack of ripening in SE PA. Kevin, you have such great contributors here! We got thru a flash flood last night, basement took on water, creek way over the banks, scary—and today found the tomato plants intact…but with even more blighted leaves than the day before….cut them all off tonight. Honey Delight and Parks Whopper are suffering the most. Juliet and Mountain Magic holding up well against the blight. Might spray with Serenade fungicide because we are due for a sunny low humidity stretch and it wont wash right off. Picking only Sun Golds so far…all the rest are so green…. One word sums up my tomatoes. DISASTER! No raised beds, no mulch. Brown spots started on lower leaves, then turn yellow , then brown and die, then make their way up the plant. Tried to trim the affected limbs off but it spread too quickly. Fruit looks healthy though. Is this the blight? Both my husband and I are starting to wonder if this is even worth it. It’s only been three days since I mentioned my toms weren’t ripening, but BOOM! They have exploded, (and the cucumbers too). I was totally unprepared for this, and have already been giving produce to my neighbors! Nature flipped a switch here in St. Louis, so the rest of you get ready…things are about to get a whole lot better. Carrie…sounds like late blight if its moving that fast. The fruit won’t survive. Best to pull plants and put them out at the curb. Do NOT compost them. Where are you by the way? Check out USA blight to see if its been spotted in your area. If not please report it so farmers and other gardeners have a heads up. It wiped me out of almost 100 plants last year. I guess I needed a big smack to learn my lesson and boy did I. Good luck and YES it IS worth it!!!!! BrandiM … Same thing happened last year. Eventually the whole plant turns brown and dies. Neighbors in the surrounding area told me it’s Verticullum (?) Wilt and it’s in the soil. We DON’T compost. We also rotate our crops. It just so disappointing when you’ve spent so much money and time. We are in the Shenandoah Valley, VA. About 1 1/2 hours west of DC. If it is blight there’s nothing you can really do, right? Carrie…let me begin by saying that I spent my honey moon in the Shenandoah valley. It really is GODs country! Beautiful. I also noticed the climate is very similar to mine. I’m about 20 miles east of buffalo. Wet and humid weather is a constant battle. Anyway…here’s what I know.. verticulum wilt does persist in soil and you can’t get rid of it without rotating away for up to 5-6 years. Most of us can’t do that me included. To properly identifiy here’s some facts: the fungus goes up roots and into stems. From there it “pinches” off water supply to leaves above so it will appear as though it wilts.during the day and recovers at night. Fusarium wilt does the same thing BUT fusarium wilt does not make a complete ring around the plant stem near soil line. F. wilt only goes up one side whereas v. wilt will girth the entire plant. V. wilt also leaves a burned appearance on leaves at the top of the plant first and there is a distinct “V” on the leaves edges that will be dark brown. Either way the plants can and do survive all season but fruiting is much less than normal. As for blight, early blight is splashed from the soil onto lower leaves. They yellow, get spotty and die. It can defoliate a plant that’s why you must mulch. It stops the “splash”. Late blight is much different. Plants can die in a little as 1-2 days. It looks like someone took a flame thrower to the leaves. The stems can have brown mushy spots and the leaves will be covered in spots that seem to appear before your eyes. The biggest telling point is that blight (either kind) will have rings inside the spots. Like a bullseye. V. wilt does NOT do this. If its early blight mulch now and save plants. If its late blight…game over. F. And V. wilts stand a chance but I would highly suggest getting resistant varieties as there is NO way to rid your soil of it. Some ppl insist on heirlooms and as avid canner I get it. The flavor is wonderful but the definition of an heirloom is the seed being viable and true to the parent plant. There are varieties that have been crossed for so many generations that their seed will still carry these resistant genes. Roma maters are a great example. Do some homework but check to see how long ago these hybrids were crossed. IMO if they were introduced even 30 years ago you should be fine. I’ve been saving seed from all kinds of veggies for years and it works like a charm. Good luck to you and all the other folks here!!!! Its toll on the plant. But for a first try, I’m happy. Out here in Utah I’m FINALLY having some tomato success this year. Last year was pretty much of a bust — great plant growth, great blossoming, just never any fruit — pulled plants out of the ground in October and had a few small tomatoes just getting started. But now all the plants are doing well and fruiting with the first ones starting to ripen. Well, actually the VERY first ones on my Sweet 100 were actually ON the plant when I put it in the ground just before Mother’s Day — go figure. That one and one of my heirlooms got hit by frost just after Mother’s Day but came back strong and are filled with ‘maters. Probably not enough to bother with canning, but I see lots of tomato salads in our future and maybe enough to freeze a few. I live in northern in. I have had the same problem last year and again this year !! The tomatoes grow up really green and healthy, have tomatoes on them, looks really good , and then just start wilting, one right after another. Also my squash look good and blooming but never produce any squash. What in the world am I doing wrong? I’m at my wits end !! I planted in mid May hoping to get tomatoes by the First of July. ( I live in west central Indiana) Lots of green ones!!!! And of all thing a volunteer plant just presented me with one starting to turn red!! Mother Nature knows best. Here in Pacific Northwest, it’s finally summer after July 4. I’m hoping for more sun to ripen up the cherry tomatoes that are growing like mad on my vines. Raised beds, not mulched, but with other small plants interspaced among the tomatoes. I’m using a flat soaker this year, and I think they really like it. Keep up the great work, Kevin! I knew better than to try to grow tomatoes without a greenhouse but I just couldn’t help myself when they went 50% off and carted home 4. So I’m experimenting with them in different areas under different conditions. So far, they are still healthy and alive. The one that is doing best is in a growing teepee I put up. The Pacific Northwest (WA. State) is not an easy place to grow heat lovers. Got my Joan Crawford approved trellis (thank you) and my report mimic’s yours. though mine are not as tall. Hoping to have TONS of tomatoes. I planted 20 tomato plants of different varieties. Cherokee Purple, Mortgage Lifter, Celebrity plus Jelly Bean and Super Sweet cherry. We’ve had a cooler than normal summer in Oklahoma so more of the blooms have hardened on. My problem looks like a tiny insect eating tiny holes in the leaves. I can’t even see them they are so small. ?? Our heirloom tomatoes are blighted in Cleveland! It looks like we will only have a single harvest this year! I live in southwest Missouri. in all my sixty-eight years i have not seen a July so cold. Temperatures in the forties at night and sixties in the day time. My tomatoes that i grow in tires have done well and we are eating good tasty ripe tomatoes all this month and more to come in later. The tomatoes I planted on the ground in rows have not done well at all. They are still short and not one ripe tomato. I prune heavily and cut off nearly all the shade leaves and suckers. The suckers i planted have done well and are growing better than the seeds i planted. The suckers i put in beer bottles full of water sprout roots when i put them in the shade or in the basement but the ones in the sun will rot. Thank you for this forum. it is my favorite garden and food prep site. Our (Hydroponicaly grown) are just beginning to ripen and taste great (after cutting around the holes that he dratted birds made) We have finally covered them with cheese cloth trying to keep them from being punctured. . They even got our big pepper just as it was beginning to turn red. We had an omelete this morning cooked buy our 11 year old grandson with the pepper and “tommy toes “and he added some mint (!) He’s creative breakfast chef ..like you . Here in the Rockies ,z. 3/4 we had a record Hot spell for the time of year ,into the 90ies every day for the last 3weeks, so not much setting but I was surprised to find two ripe purple prince and another ripe Italian heirloom, no name! Incidentally tomatoes don’t require a pollinator, a good breeze or light shake will do the trick. That is whyheirloomsgenerally come true from seed. I had planned (following your sage advice) to have a mini-trellis consisting of 6 plants in one of my 4×4′ raised beds, but late planting and vigorously sprouting missed garlic seed in the designated area scuttled those plans, so I used cages for this year, planting plants wherever I had room. Being even a little farther Upstate than you are, they took awhile to get going. I have the bottoms of the plants mulched, if you will, with old black “automators”. I did not remove many suckers because it is hard to get to those…suckers while using cages! Even my cherry tomatoes are still green, but all plants are looking great and are laden with fruit. I have ‘Rose’ and ‘Cherokee Purple’ and Sungold cherry tomatoes. I WILL be bringing the just-ripening fruit into the house before the chipmunks have a feast! Hello everybody. I live in south NJ near Atlantic City. We just moved into this house so this is my first veggie year. Since we have deer, I have a plot in the community garden. It’s only 4X8 but sufficient for my 4 Cherokees and 3 Oregon Springs, and more. So far so good, they’re loaded with tomatoes, waiting to ripen. They are in raised beds filled with Eco-Soil, a compost mix, and mulched with salt hay. (although it’s not relevant, I have also harvested 9 lbs. of yellow bush beans from this same plot). I also have tomatoes in containers here at home, doing well, plenty of tomatoes. I plant all with dried milk and a match in the planting hole, for calcium and sulphur. It seems to work. I also spray regularly with liquid kelp, and use neem for insects. This year we took down a wooden ramp leading to the deck and we reused the lumber and made 4 raised beds in the backyard. In one of the beds I planted strawberries, one has 3 tomato plants I started last year in the house from seeds I saved. Along with the tomato plants I planted pickling cucumbers. Both types of plants have taken over the 4X8 raised bed. The tomato plants are over loaded with fruit and I have pickled cucumbers 4 times now and they still keep coming. I have gotten 2 ripe tomatoes so far. I didn’t prune the plants, but should have. I haven’t had any problems with disease so far. The 3rd raised bed has broccoli, cauliflower, and beans growing in it. I did have trouble with cabbage moth and their off spring but found a organic spray made from onion, garlic, hot peppers that really has helped. I have harvested several heads of broccoli and the cauliflower has heads on them now. The 4th bed has beans, tomato plants ( Mortgage Lifter, Heirloom ) and Dr. Martin Lima Bean plants. Everything in the bed is growing well except the tomato plants. The tomato plants just aren’t growing much at all. I bought these from a greenhouse, planted them in April and they haven’t grown. This variety of tomato is suppose to produce 2 pound tomatoes. If anyone can offer a reason why they aren’t growing, let me know. The bed has horse manure, compost and a good clean dirt just like the other 3 beds. I was thinking about moving the tomato plants and replanting them in another garden that I have growing with other vegetables. Once the tomatoes start to ripen, I will be doing a lot of canning. I’m in southwestern PA. All my veggies are in raised beds or containers. We experienced the same conditions you did, Kevin… late frost, cold spring, then beastly rain, heat, and humidity. I grow heirloom tomatoes. Most of my plants originated from seed started in my basement under a grow light in February and then were transplanted– although I also allowed one volunteer to remain from last year that appeared in the tomato bed. All are doing well. I pinch off the blighted leaves as soon as I see them, and for the first time, I have removed the suckers as detailed in your blog. The plants are bushy, deep green, and I have lots of green tomatoes. I find that they outgrow the cages and I am compelled to provide additional support and/or tie the branches up– the weight of the fruit makes them “fold over.” Here’s to a bountiful harvest for all! Mine has been FRUSTRATING!!!!!! Last year I battled blight all season, so this year I planted in a new set of tires on the opposite side of the house, gets 8 to 10 hours sun there a day, composted well with new compost (have horses and used from poop pile that had been composting for 2 years), covered soil with straw, put landscape fabric in between the tires and topped that with wood chips from local tree removal company to form pathways between the lines of plants, planted marigolds in every second tire, trimmed all the lower leaves so they were at least 4 or 5 inches above the ground, removed suckers regularly, sprayed with mil and water solution when I first saw blight invading despite all my efforts (cold, wet and slow May and June and July brought a bit of heat and humidity but it has been in the 70s again this past week! Then yesterday it was a tomato hornworm invasion and on top of that the new shoots are covered with aphids!!!! !, Tomato hornworms also on my jalapeno peppers, as well as tiny little worms on my asparagus!!!!! I have tried so hard not to use pesticides but in desperation I removed all the monsters that I cold find and sprinkled Seven on them all, not sure if that was the right thing to do but as I said I was desperate. Most of my tomatoes are Romas and they have a lot of green fruit on them but it has not been hot enough for long enough for anything to ripen yet. I am in Central Indiana. HELP! Hi Kevin. I’m in Western MA and, I too, have my garden in Raised beds. My tomato plants are lush and Ubber-Green, with tons of fruit. The only ones turning red are my Cherry Tomatoes and Sweet 100’s. I harvest from 2 or 3 to a handful each day. I’m still hopeful that one day I’ll go out there and my Plum and Brandywine Tomatoes will making me scurry to harvest them all. 🙂 So far, NO blight. X,, <~ fingers crossed! Now I'm off to re create your wonderful looking Blueberry Buckle. I started quite late – last month. Have not had the best luck with tomatoes, but I found some good sized plants on sale at my grocery store for $1.50. These are grape tomatoes, but I was more interested in finding out IF they would grow at all. So, I purchased one, repotted and place it on my back porch steps. I have loads of tomatoes and even more flowers. I was so happy just to see the flowers and not sure what would happen next. I also de-suckered, but I may have been a little to aggressive. Anyway, I have a few that are red now, not yet ripe but I cannot wait to see how many I get. Thanks for the inspiration. Would not have tried again had this little experiment failed. No tomatoes here. Too hot in SW FL! Looking forward to fall when I plant them! Hello Kevin, gardening pal to thousands…. I have fruit coming in from the Red Calabash’s, a squat wrinkly Mexican heirloom and the Sun Gold yellow cherry tomatoes. One German Johnson is also nearly ripe. Other varieties here are Indigo Rose, waiting until it goes from blue-black to brownish black for ripeness, Jaune Flamme, Tomatoberry, Yugoslavian heirloom and St. Pierre the French Market heirloom. All were grown from seed by me starting in the first week of April inside. Most of the cages have two tomato plants in them. Most cages are wire, foldable and square with prongs. 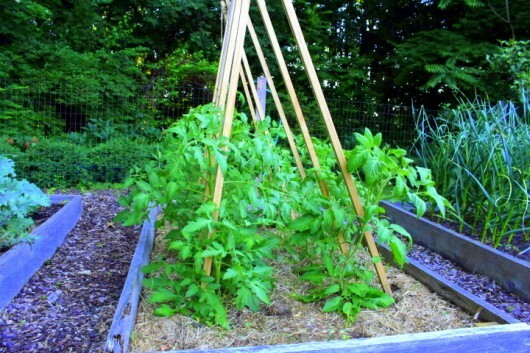 Two are Texas Tomato Cages, stacking two piece, wire, foldable and extra tall. I have not taken time to de-sucker or limb up the plants. This is the first season in many years this has happened. I do see some yellowing of lower branches. I do rotate annually the best I can on my small plot that is home to 400+ perennials as well as many other vegetable crops. All tomato plants are mulched well with long pine needles or my own straw made by chipping my ornamental grasses in February. I created a walled soil moat around the base of each plant to catch water and direct it to the root zone prior to placing the mulch onto the soil. I watered each tomato seedling when installed in mid-May. I supplied no supplemental water until July 12th when it just seemed too dry to wait for the rain. We had rain regularly enough in those two months that I was given a vacation from watering tomato plants. I have not seen any blossom end rot (yet!). Bees of all kinds are in short supply here, depressing news and probably Monsanto is to blame in some way, but I believe tomatoes are wind pollinated. I am eager to set up the dehydrator. The recipe for Dried Tomato Pesto on Barbara Kingsolver’s website “Animal Vegetable Miracle” is to die for – the most decadent thing to ever come out of my kitchen, and that’s saying something. Can’t wait, can’t wait! Put it on a half slice of hard boiled egg and put the whole thing into your mouth. A party on the tongue! Better spot this year, more sun=more fruit on the vines. Wetter than usual here in Northern Virginia and of course, humid as always, so I’ve been expecting disaster with my tomatoes any minute (blossom end rot usually does them in.) BUT so far the plants are still nice and green and full of fruit. Really don’t know why, keeping fingers crossed! All plants are in raised beds, one of which is right up against a sunny brick chimney, where they are trellised. The 5 indeterminate/trellised (Jet Star-just got a 13-oz from that one; Kelloggs Breakfast, an orange variety with a lot of medium sized fruit, a Rutgers with biggest picked so far at 16 3/4-oz, a Better Boy with medium fruit, and a Mr. Ugly with medium to large fruit, not ripe yet. But the first plant to bear ripe fruit was a bush variety, Phoenix, my first foray into the world of determinates. I have two other bush types, Goliath and Heatmaster, and they are also bearing a lot of nice medium-sized fruit. I have one more indeterminate in a cage, Solar Fire, which is advertised as heat tolerant and from which I just picked two very nice 4×3.5″ tomatoes. My two cherries, Sweet 100 and Black Cherry are going nuts and taking over their bed as usual–one is climbing up the cucumber trellis and since it’s in a raised bed, the fruit is already over my head! I also have 2 San Marzanos which are just starting to pink up. Not enough to make much sauce, but fun to grow. My husband raised the four already-one-foot high beds for me this year to about 3 feet high (I have some disc problems) and planting/caring for the garden has been the easiest ever! He built each one on a platform and the dirt fills only about the top 8-9 inches. I do de-sucker, but missed some this year when we went on vacation, so I see today that I have some work to do! I didn’t mulch, hmm, should try that next year. I got mine in late,but hopefully they will produce. I’ve buried the black pot in the ground about 2 inches which helps hold the moisture. They are green as yours with flowers so maybe I’ll get some tomatoes. Hi, Kevin! Love your website and newsletter. I have 2 Early Girl and 2 Brandywine (heirloom) tomato plants in my raised bed, each with a tall cage. I mulched with compost about a month ago; removed the suckers; dosed each plant with Epsom salt solution about a week ago; cut off small branches on the bottom 6″ or so. The Early Girls are about at the top of their cages, have lots of tomatoes, and lots of blossoms. One tomato has started to turn red 🙂 The Brandywines are shorter but catching up and have a couple tomatoes so far. A few leaves are yellowing, so I cut them off. My tomato plants are competing with the zucchini plants for sunlight. All my squash plants have gotten huge this year! Making zucchini bread today. Wow, Kevin…it’s easy to determine if you are having a give-a-way. Typically, there will be hundreds of entries – shucks thousands – if you have a gift to share! I truly need to give up the thought of growing tomatoes. The deer take them all! A thought…do you have any Angel Trumpets (Brugmansia)? I have quite a few of white, peach, and yellow. Lovely foliage but no blooms yet. I’ve given away many rooted cuttings to friends and neighbors; many folks already have blooms! I’ve heard that if a person removes the bottom leaves, it will force the blooms early. Is that true? Here in central Indiana, after the horrid winter, we had a wet spring and equally wet June. Everything in the garden, tomatoes included, have grown like weeds. For the first time in over 30 years of gardening, I staked my 36 tomato plants and de-suckered them. I’ve always mulched with hardwood bark mulch after applying a homemade mix of dried molasses, alfalfa meal, and Redmond (a livestock mineral conditioner that works wonders on veggies). I must say the results are very impressive. The plants are loaded with beautiful tomatoes. Only two have ripened yet, which is a few weeks late for this area, but when they do turn red, it’s going to be a tomato tsunami. BTW: I really like the info on picking tomatoes just as they start to ripen. So many times birds or other critters get to them just as they are fully ripe. I’m going to do that this year. The only problem is now we’re two inches behind on rainfall for July. For the past four summers, we’ve had a month of drought (varying each year, but always between May and September). I sure hope we aren’t entering a dry spell. Had to water the garden last evening, giving the tomatoes an extra soaking. I know that blossom end rot can show up when the water intake is uneven…wet, dry, wet, etc. Hope to avoid that problem after such a great start to the season. Hi, from Aurora, Colorado! Started my garden too soon in early May and had to replace a couple tomatoes plants, due to a late frost but everything is growing and blooming quite nicely. Can hardly wait for early girls and fantastic to get red and this year I planted a heirloom, mortgage lifter, too. So far , have picked only a handful of super sweet 100s but others are getting ready to turn. Love the raised beds and my 2 zucchini plants are growing like crazy so I will munch on them til the tomatoes are ready! My tomato plants are slow growing. I have had several tomatoes but something keeps getting in and eating my fruit! Any suggestions on keeping squirrels from eating the tomatoes? I have a fenced in garden, and have even put netting around my raised beds. It just hurts to watch tomatoes just disappear overnight. My tomatoes are heirloom. One plant has a ton of tomatoes and the other has none. They are next to each other and two different varieties. On Wednesday we had a nasty hail storm and it pretty much obliterated my garden leaves. 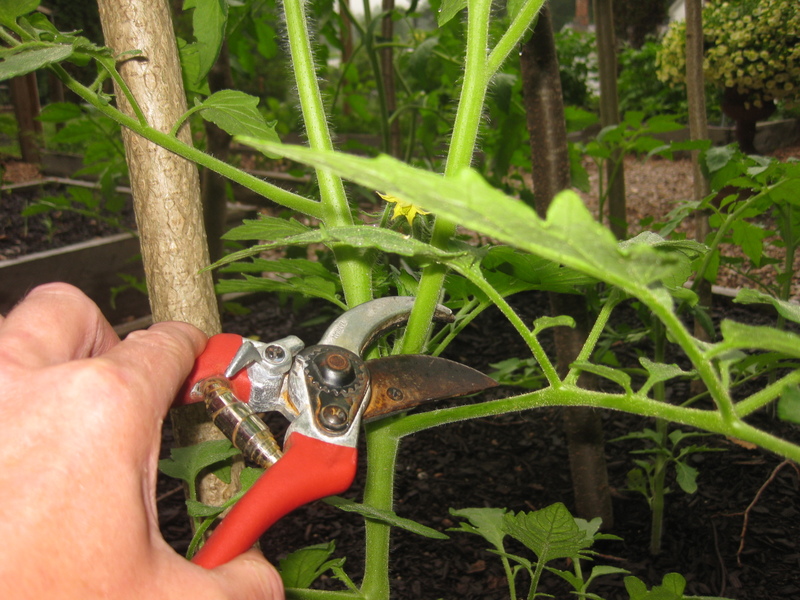 I cut back many of the leaves and branches on the tomatoes that were left close to leafless. We’ll see how they recover. Hi Ho from Wisconsin: I save my seeds and start plants under lights in basement about mid March. I have cherries ripening and a couple of early girl. Lots of tomatoes, some blight from all the rain, but cutting it off. Planted in ground with wire cages tied to a fence to hold them up. My plants always get huge even with cutting them back. I have 16 plants and will most likely get several bushels of toms. Also harvesting cabbage, kohlrabi, celery, broccoli,garlic, beans and onions. We have had tons of rain, (yipee) and cool and hot weather. I use Gardens Alive tomato fertilizer which is organic, and that is it. All my tomatoes are heirloom. I plant them in different gardens each year. I am so lucky to have the heart of a farmer here at my Pare n Dice Gardens. In NM we’ve had really cold weather (for spring) followed by unusually hot weeks, then rain and hail. Too hot for some of the blossoms to set fruit, but we are beginning to have lovely large tomatoes, just started picking them today. We raise ours under shade cloth to reduce wilt (since the vector doesn’t like shade! ), but we’ve been fighting hard-to-find-hornworms which we look for every day. We have a very small space, so we’ve used Earthboxes this year, planted in barrels other times. Sometimes they get blossom end rot, but a calcium spray helps reduce that. We’ve staked our plants which are nearly five feet tall. We started two plants from suckers that we cut off, and they’re thriving. In the City of Schenectady, I have three plants – a Roma, a Sweet 1M, and a Brandywine – growing in cube-shaped growbags. They went in a bit late, but are now thriving with no sign of disease and green tomatoes on all plants. I use Osmocote and Rootblast amended potting mix with moisture granules to help keep the soil fron drying out and precent splitting and blossom end rot. I have not suckered the plants, but I plan to do so this week since the plants are very dense and I would hate to see them falter. Good luck to all! Our tomato plants are big, healthy and beautiful, but there are not scads of tomatoes and no red ones in sight yet. I guess it’s a great season for foliage here in the northeast, but not for the fruits? I made a couple of trellises this year out of grape vines, which I’m so happy with I’ll be ditching the cages altogether next year. Might even use the grape vines for cukes, squash, etc. I work at a hardware store where we sell a gonzo number of tomato cages, but I have to admit I hate them. 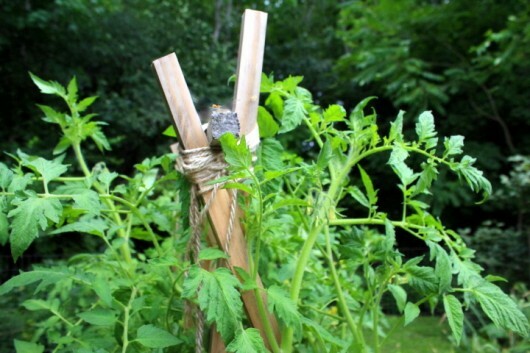 My tomatoes outgrow even the tallest cages, which I have found give more reliable support when used upside down (must like a teepee of stakes, so that’s the route I’m going). Here in southcentral PA we’ve had all kinds of weather. For whatever reason, this is the first year I can remember when we don’t have any blight or blossom end rot. Just picked our first ripe tomatoes about a week ago, and others are starting to ripen slowly and steadily. My tomatoes are looking quite good this year (after a couple of years of dealing with blight). Once we got some hot weather here in Seacoast NH in June, the plants took off. I’ve only picked a couple of grape toms but there are many green ones of several varieties that will ripen soon. I sprayed a fungicide directly on the garden before planting this year and put down some composted manure followed by a layer of landscape fabric. Then cut small holes for the tom plants and the new spirally poles I’m trying this year. So far I’ve had very little blight (only a couple of plants and I took those leaves right off). I’ve also been desuckering. So far the spiral poles have been very easy to use and are holding the plants well – they look a little Seussical especially since they are red and really stand out. Hey Kevin, just saw your post this morning. I live in Northeast MS and we have not had any luck with tomatoes for the past several years. My husband has horses so he has been composting horse manure for the past several years. He decided to make a raised bed this year and used only this composted manure. The plants are 6 feet tall and producing lots of great tasting tomatoes. We planted celebrity plants and they are so good. He did plant too many in the small bed but they are still producing well. I also sucker the plants. Always love to read your post. I planted my one plant and used a trellis. Did not remember about desuckering. I got a lot of nice fruit. Then the vine turned brown. I don’t know if that is normal progression or the effect of too much heat and rain. I live in the Pacific NW. We had a freak hail storm which shredded most of my garden. We noticed mildew on our tomatoes – made a mixture of 1/4 cup of baking soda to a gallon of water and sprayed them. The mildew went away but we weren’t getting blooms – got out the epsom salts and watered it in – within a week they were covered in blooms and now we have tons of little green tomatoes. Now if the heat will hang around we’ll have a glorious crop! I live in Northwest Conn. The weather has been crazy. It is rainy, windy,humid rarely sunny. I have tried so hard with these tomatoes. My very large pot with mini tomatoes started showing yellow leaves at the top of plant. It was so beautiful and green. I started cutting off bad leaves and stems. Today we are having a giant storm with wind, heavy rain. Tomorrow I will probably be disappointed but it was kind of exciting to see yellow flowers. I will never give up. Last year I had two tomato hornworms. To hey we’re horrible looking but I learned about parasitic wasps. Kevin, I love your column and recipes. I have watched so many videos so many times about due suckering. I think I must have a learning problem with this. Enjoy your summer. To keep your tomato plants free from blight put one calcium tablet in the hole when planting for each plant then put one in the ground monthly at the base of each plant. It will dissolve into the roots It works!!! I’m northwest of Toronto, Ontario in zone 5, but the nights have been too cool for the tomatoes. The ones in the ground are big with lots of flowers but few tomatoes. The ones I planted in straw bales have mixed results. The 10 year old straw bales are doing fine with the tomatoes growing normally; but the plants I put in last year’s straw bales are all dying. I forgot to ask the farmer if he used the new chemicals on his wheat crop and it’s pretty obvious he did as all the plants are shriveled and will die off soon. I can’t even use this straw for mulch, since the chemical residue leaches constantly and will remain in the compost; hindering all vegetable growth. Even after I put in tons of eggshells and gypsum prior to planting season. Blossom End Rot. Again. Despite adding eggshells and gypsum to the bed. I learned about trimming suckers too late, but I have been lucky and my cherry tomatoes have been abundant, though the Bush is HUGE! My celebrity tomatoes haven’t been as prolific, but I have at least harvested a few. I think next year I will stick with the yellow pear cherry tomatoes. I like them better. I do think our unusually cool Midwest summer is to blame for lack of growth in my bigger tomatoes. My parents are having less of a bumper crop than I am. I know I’m a bit late, but yes, are you right, I grew my tomatoes on level ground, in wire cages, without mulch and without removing a single sucker. The plants are loaded, and I’ve been getting huge ripe beefsteaks and other large tomatoes for a couple of weeks now. The weather this year was awful, first cold then rainy, then hot then cool, now dry. Plants are green, growing like mad and producing heavily. I have red, yellow/gold, striped gold/red and pink. All are doing well. I don’t care what the cause of all this production is, but I’ll take it!! Just canned 18 quarts of tomato sauce today. Fighting off the blight in south central PA. Canning them as fast as they ripen but the blight seems to be winning. Curious about the calcium tablet suggestion above. Anyone else try it? Why does it work? We get the blight on our heirlooms pretty much every year. It’s never a case of “if” it’s “when”. Last year’s blight was late and I put up over 150 jars of sauce, salsa, pizza sauce, diced tomatoes, and BBQ sauce. This year I’ll be lucky to get half that, I’m afraid. Too rainy and cold in PA this summer. Kevin, I asked your advise a few months ago about my mini rose bush. I forgot to reply how it was doing. It is still small, but has buds on it. Thanks for your expertise. I am not sure what tomato blight looks like, but I don’t think I have any… probably beginners luck. What I do need is suggestions for the simplest way to preserve all these tomatoes to use through the coming winter. 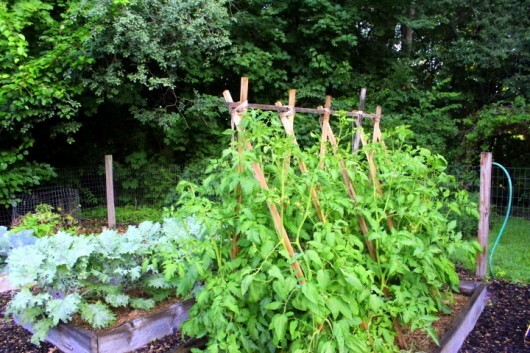 Seven very tall Parks tomato plants and September 30 only two little red fruits. Strange. Pluck them now, or in a month? They look like perfectly ripe and ready plum cherry kind but they were supposed to be more like Beefsteak tomatoes. Will they go bad if I don’t take them now? The weather is mild here right now, sixty to 75.